If you’ve been reading FBE for a while now, you might have already heard of a tradition my husband and I do every year called Friend Feast (see past year’s recaps here, here, here and here). What started as a potluck-type Friendsgiving many years ago morphed into a multi-course dinner party and now — with a table set for 14 this year (YES, 14!) — it’s probably the biggest event we host at our house, complete with beer- and/or wine-pairing for our friends. And this year’s Friend Feast … not to brag … but, it did not disappoint. We knew we were going to have a large group this year, so we wanted to a) make something that could actually feed 14 people and b) do something a little extra fun — something people don’t have every day. And so the research began. I knew I wanted to do paella. And I wanted to pair it with Spanish wine. Problem was, I’d never actually had what I’d call really good paella and while I liked Spanish wine, I didn’t know much about it. 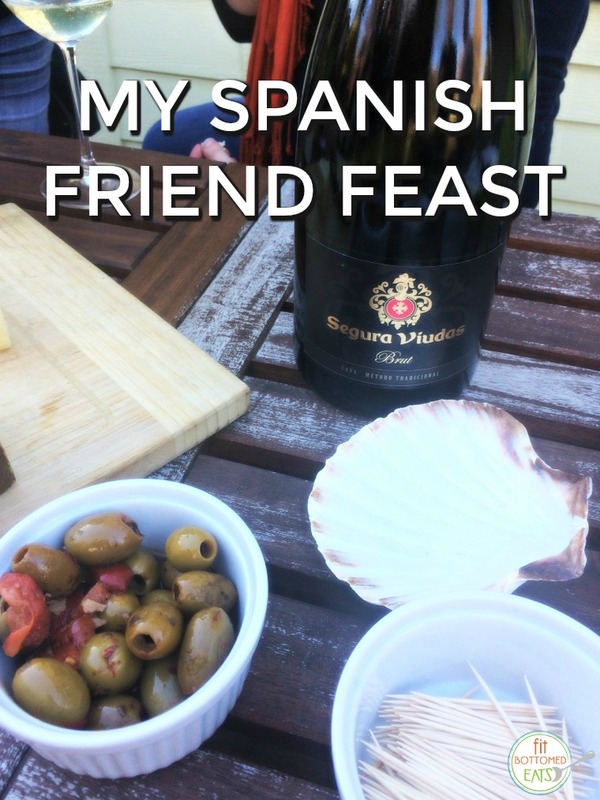 So Ryan and I got to testing multiple recipes (in, like 4-serving portions on the stove, which was in and of itself a whole other thing because we knew we’d have to make it outside in a giant paella pan for the real deal) and tasting numerous recommended bottles of Spanish wine. It was hard work. But we did it. For the good of the event, ya know. And all the delicious work paid off, too. 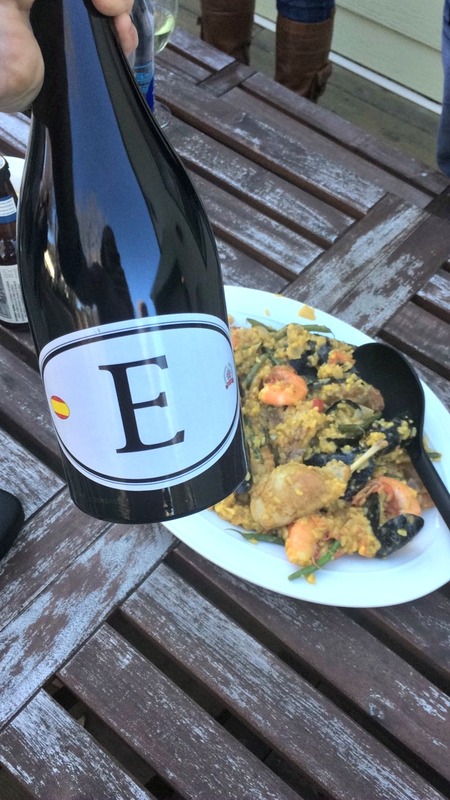 After a few months of research, we found wine that worked beautifully and could flow freely without breaking the bank AND we figured out the basic process of making paella and what we wanted/didn’t want in ours. Because the paella itself was such a showstopper — and because we wanted to stay true to the form to the Spanish theme — we kicked things off with basic tapas, and ended the night with an almond cake from a recipe that I just happened to stumble upon a week before and took a gamble on by making it for the first time (a cheese plate was my back-up). Lucky for me, the cake was PERFECTION. 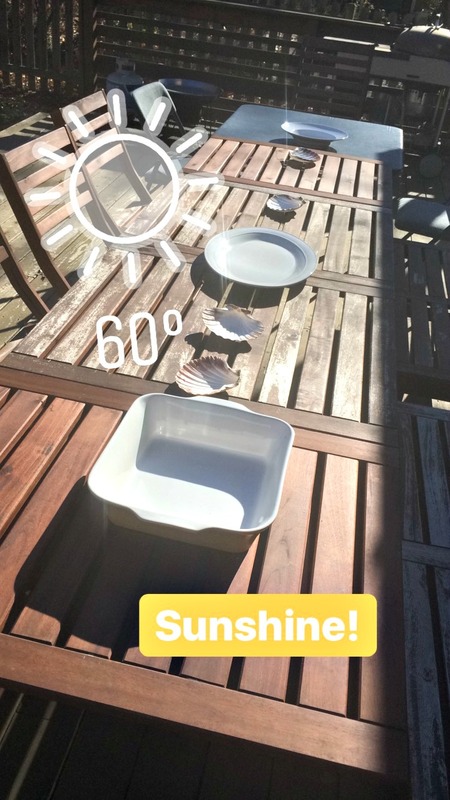 As was the weather. Nothing like 60 degrees, sunshine and friends for an epic evening. Here’s more on each course, with pairing info in case you want to try it yourself! We knew that the paella was going to be the star of the show and would take a decent amount of prep and time cooking. 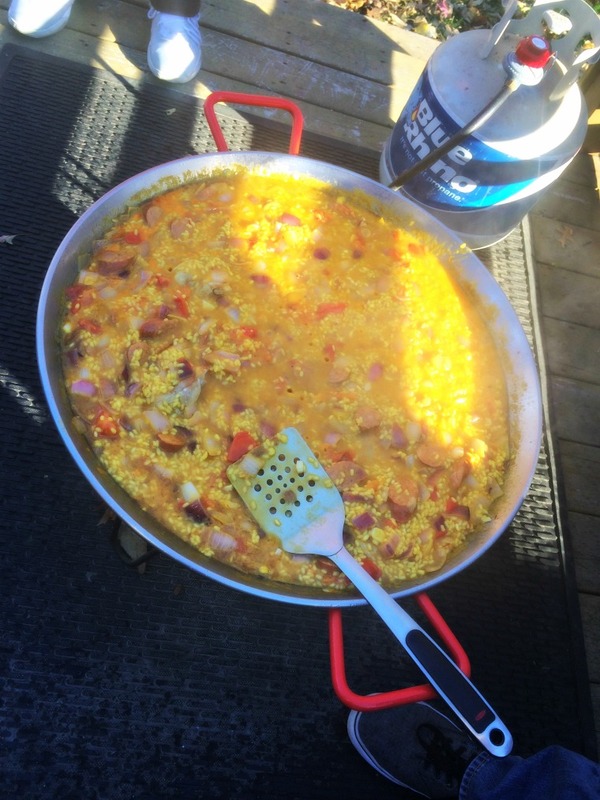 While paella for four or even eight people is a pretty easy dish to pull off, cooking for 14 outside is another thing. So! 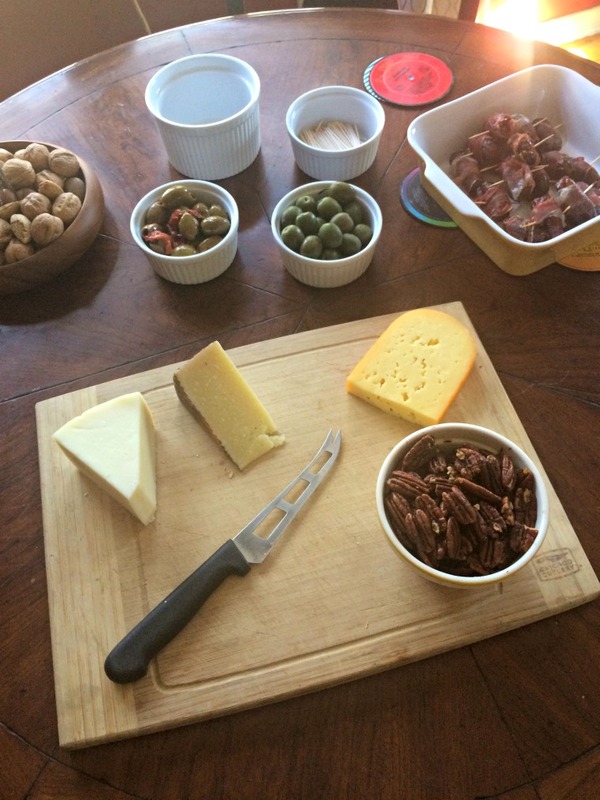 We made it easy on ourselves with a variety of tapas that we could prep ahead of time. After alll of those paella recipes we tested, we knew that we wanted to include mussels (so fun), shrimp (the bigger the better) and a spicy sausage (so tasty). In previous recipes, clams were totally awesome, but cost prohibitive in our area. And while chicken was tasty, well, it didn’t seem unique enough. And while I loved peas, my husband didn’t. So we ended up tweaking this recipe from Food 52, using rabbit (yes, you read that right), mussels and shrimp for the protein, and green beans for the pop of green. We also used way more white wine to cook the rice in — and ended up cooking the mussels separately so that we could get the liquor from them and cook the rice in that, too. It took us a little more than an hour to cook it all outside, over a propane tank. Like I said earlier, I found this almond cake recipe on a whim, but I’m so glad I took a chance on it. 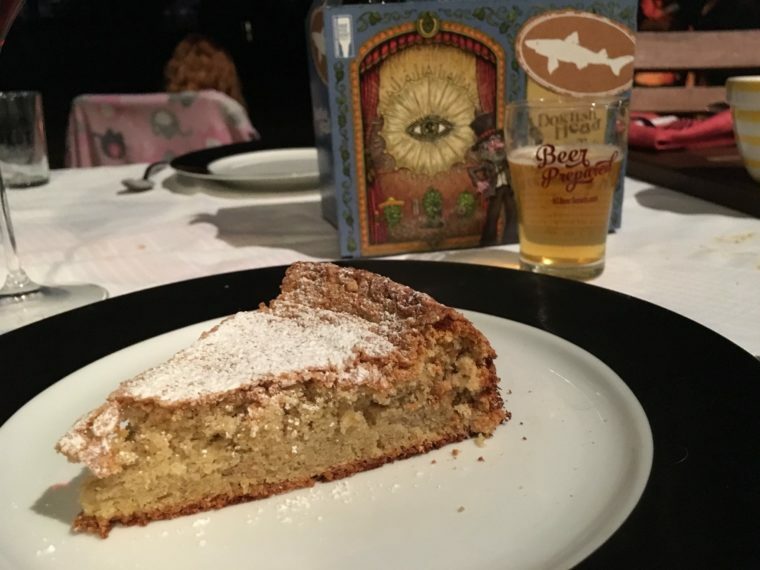 Naturally gluten-free, it has quite the historical story and was so freakin’ delicious. There are a few variations on it that you can try, but the one I made (actually a double batch, because, again 14 people) with a little extra lemon zest and some cinnamon was worth repeating. Probably the one thing of the night that we got the most compliments on! We ended the night with good tunes around the firepit — paired with more beer and cava. It was great. And I have no idea what we’re making next year, but you know I’m already thinking on it!